LOVE seeing the commission sketches, as always! But usually the thumbnail links to an image that's at least a bit bigger so we can have a good look at them... can you do that again? Brandon: I don't know why Blogger wasn't making a full sized jpg available, but I have fixed it now. Weird, still doesn't seem to be working. Chrome just has a regular pointer, Internet Explorer has a hand icon but it doesn't do anything when you click on it. Don't have Firefox on this particular machine at work. I was wondering if your going to make prints of abominable Charles Christopher to your fans??? I was on the site and its an awesome piece that you did!!! 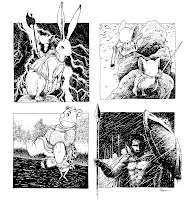 The commissions look awesome-particularly mine, the Black Axe Adam Mouse riding the Hoppy hare. Thanks for doing such a great job. Will you be shipping it soon? Awesome!! I love the one of the mice on the rocks. I would love to see a Mouse Guard story that takes place out at sea! Maybe a treasure hunt type story! That would be a sweet story for an annual.